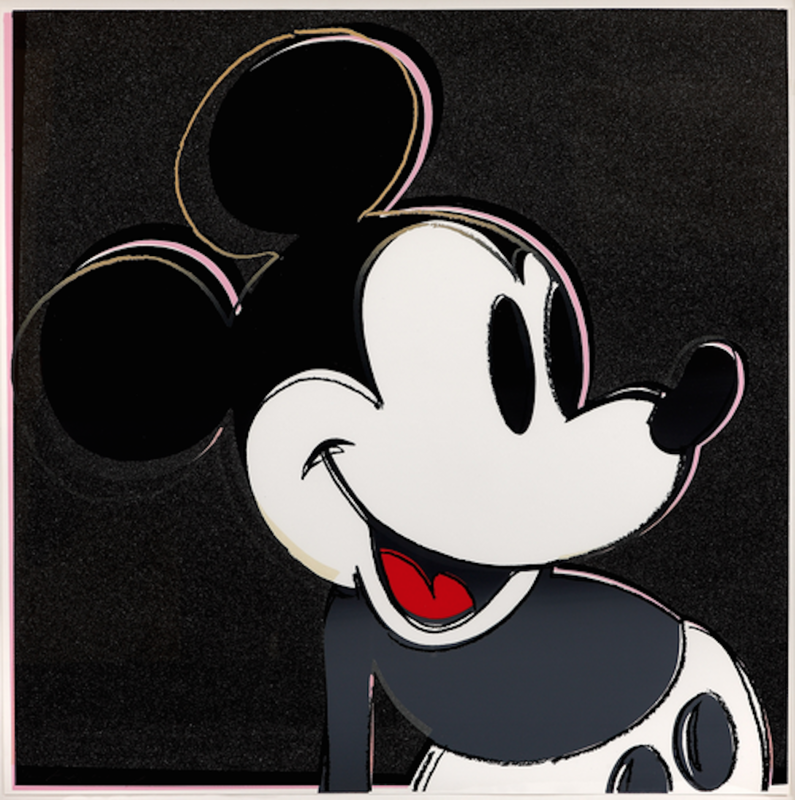 Mickey Mouse is part of Warhol’s Myths portfolio, which also included characters such as Superman,Howdy Doody and Dracula. Mickey Mouse is a cartoon character that was created by illustrator, Walt Disney in 1928.In 1981, Andy Warhol strayed from his conventional work, which consisted mainly of portraying celebrities, and decided to create a portfolio of 10 screen prints of fictional characters, including the ultra-famous Mickey Mouse; the whole became known as the Myth series. The subjects of these screen prints, most of which originating from old Hollywood movies and 1950’s and 60’s television shows. Mickey Mouse undoubtedly stands out amongst the others as he continues to hold a special place in people’s hearts. The Myths Portfolio is one of Andy Warhol’s most sought after collections. Andy Warhol’s Myths collection contains ten screen prints of iconic mythical figures, including Santa Claus, Superman and Howdy Doody, among many others.From the 1960s on, Andy Warhol exhibited an unerring sense for the powerful motifs of his time – contemporary images that capture the modern imagination as completely as the gods and goddesses of ancient mythology once did. In Myths, Warhol’s 1981 portfolio of 10 screen prints, he was referring not to remote civilizations, but to the beginnings of the cinema and the imaginary characters loved and recognized by millions all over the world. Most images in Warhol’s Myths series are taken from old Hollywood films or 1950s television and portray the universal view of America’s once enchanted and powerful past. Included in the series are characters loved by children such as Superman, Howdy Doody, and Santa Claus, as well as fictional figures like Dracula, The Wicked Witch of the West, and Uncle Sam. Mickey Mouse is a cartoon character that was created by illustrator, Walt Disney in 1928. He was created as a replacement for another character, because of copyright issues. The sketch eventually became the mascot of the Disney brand and a character adored by children for generations since its creation.Andy Warhol soon recognized the fact that Mickey Mouse was a huge icon in pop culture and so made him an integral part of his Myth series. Warhol wanted to reflect the origins of cinema and present fantasy characters that were loved by millions of people worldwide.